Still, it seems, almost immediately after a string of uninspired days, I’ll be filled with a creative impulse that allows my brain and my ego to shut off just long enough for me to type with abandon. And generally, that inspiration comes from the kitchen, a dish or dessert that rekindles that desire to share, a literary running around with the spoon, eager to feed everyone. I had intended to make a springtime pizza this week complete with a new dough recipe I’m working on in my head. But a succession of incidents left me feeling discouraged, and I never got around to making the dough. As of yesterday, the English peas, fava beans and asparagus for the pizza were still sitting in my fridge, next to the three pints of ruby red strawberries I picked up at the farmers’ market last week. I love strawberries. In fact, I love them so much, and I ate them with such gusto as a kid (strawberries, strawberry jam, strawberry shortcake, strawberry yogurt—if it had strawberry in it, I ate it) that I developed a strawberry allergy. For nearly a decade, those sweet, juicy berries were forbidden fruit. I grew out of the allergy, thank goodness, but to this day I savor every berry like it might be my last. I try not to over-indulge, but the force is strong with me. I can easily eat a pint in a sitting. Surprised that I hadn’t eaten more of them, my wheels started churning. I learned long ago that pity parties are best with ice cream. So I decided to take advantage of my new loaner, countertop ice cream maker, my semi-sour mood and riff on the strawberry thyme sorbet recipe I’ve been playing with. (Thanks Adam!) And wouldn’t you know, inside the perfectly smooth scoop of strawberry rosewater sorbet last night was that seed of inspiration that I had been looking for. Now I have two recipes to post! Rinse and hull the strawberries, then quarter them. Add strawberries, sugar, lemon juice, rosewater, salt and vodka to a medium bowl and cover with plastic. Let the strawberry mixture macerate for a half an hour and stir. Let stand for another half an hour. 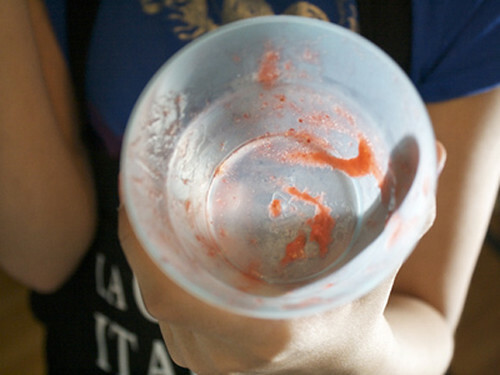 Puree strawberry mixture, then push through a fine-meshed sieve with a wooden spoon to get rid of any pulp or seeds. Chill mixture for 6-8 hours and then freeze according to your ice cream maker’s instructions. Rinse and hull the strawberries, then quarter them. Add strawberries, ½ cup sugar, lemon juice, vodka and pinch of salt to a medium bow. Let macerate for an hour covered with plastic wrap, stirring occasionally. In the meantime, place ¼ cup water, ¼ cup sugar and thyme springs in a small saucepan, heat until the sugar dissolves. Let cool, then pour over the strawberry mixture. Let macerate for another half hour to hour. Remove thyme spring and puree strawberry mixture. Run through a fine-meshed sieve to get rid of any pulp or seeds. Chill mixture for 6-8 hours and then freeze according to your ice cream maker’s instructions. My strawberries rarely make it inside the house. I can sit in the patch all day long just munching away and dreaming what they could have made. I do love a good sorbet and thyme is such a wonderfully versatile herb. Glad to see you got the jou jou back and it’s revving something fierce! I wished I could have been around to be your taste tester, but it looks like you had two very willing participants! These strawberries look divine. 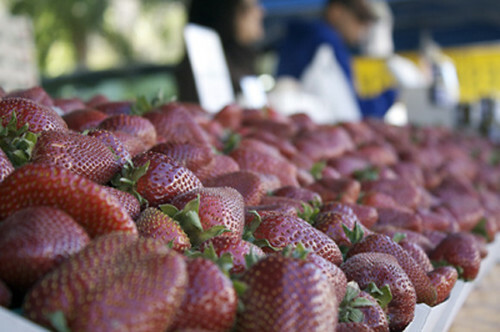 I love all the strawberries at the Farmers Market this season. So delicious! I really enjoy your writing, it makes me want to work harder, and create more. btw i made a brown sugar strawberry ice cream last night that was delicious. 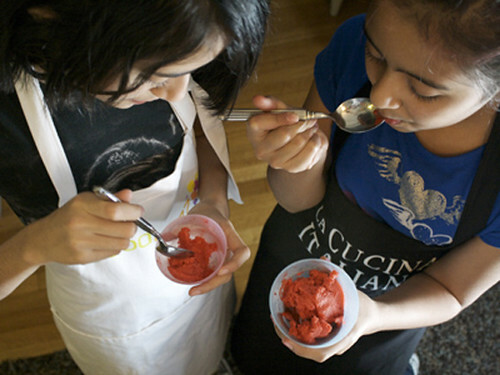 so now i am gonna make your recipe for strawberry thyme sorbet is sounds great! Thanks Leslie, that’s a wonderful compliment! The brown sugar strawberry ice cream sounds incredible too. I’ll have to tr that. Making this right now 🙂 Lovely recipe, thanks!